Ahead of their Free Patient Information Event in the County Arms Hotel, Birr, Offaly on Thursday, June 28 from 7-9 pm, the Migraine Association of Ireland have issued their six top tips to help migraine sufferers get through the summer months. Migraine is a complex neurological condition and so much more than just a headache. If you or a loved one suffer from migraines then you know that nausea, visual disturbances, vomiting, light sensitivity and partial paralysis are among the list of debilitating symptoms that can also accompany a migraine attack. - Stay hydrated – high heat and humidity increase dehydration which can trigger migraines. - Monitor changes in barometric pressure which can trigger migraines in some people particularly during periods of hot and humid weather. While there is little you can do to combat this do ensure you are properly rested and rehydrated on these days and don’t schedule in too many events during these periods. - Protect Your Eyes – invest in good quality sunglasses or contoured migraine glasses, such as MigraLenses. - If you are flying off to the sun, skip the pre-holiday drinks on the flight there as alcohol, combined with the stress of travelling and the environment of the aeroplane, may consign you to a darkened room for the first few days of your holiday. - Avoid exertion in the sun. Losing a lot of water and sodium through sweating can trigger migraines. Switch up your daily run or other aerobic activities to the early morning or late evening. 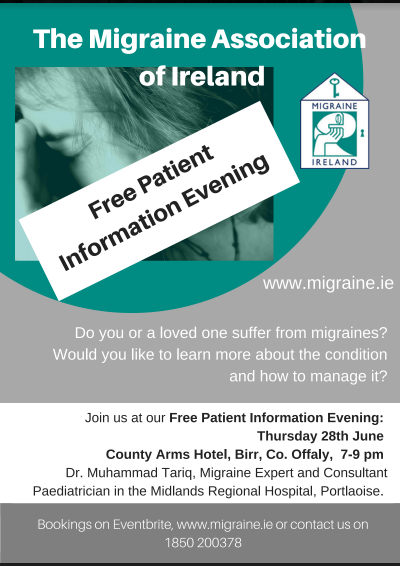 The Migraine Association of Ireland are holding a Free Patient Information Seminar in the County Arms Hotel, Birr, 7-9 pm, June 28 where you can learn more about managing your migraines and reducing the frequency and severity of attacks. Bookings on Eventbrite or by emailing info@migraine.ie. You can find out more information on the Migraine Association of Ireland on their website, www.migraine.ie.